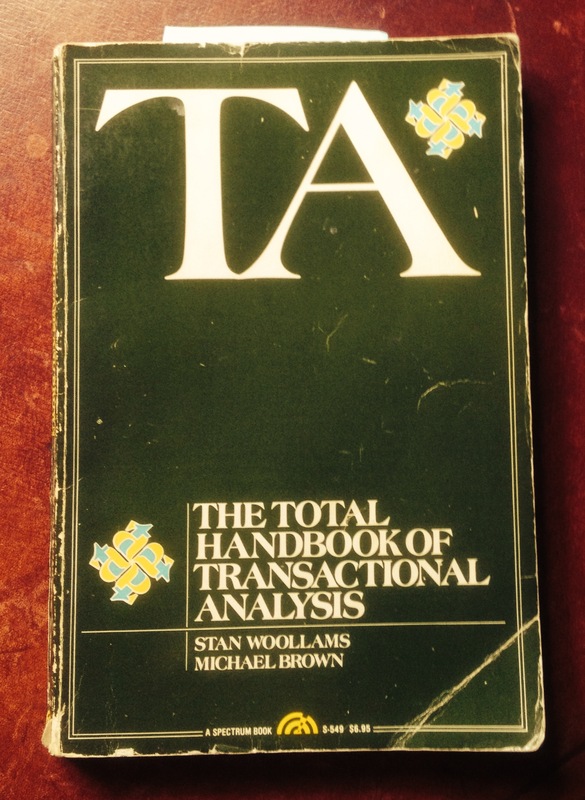 Before we move onto to the next stage, a quick look at a working example might help here, to illustrate the power of the Transactional Analysis model I discussed last time. 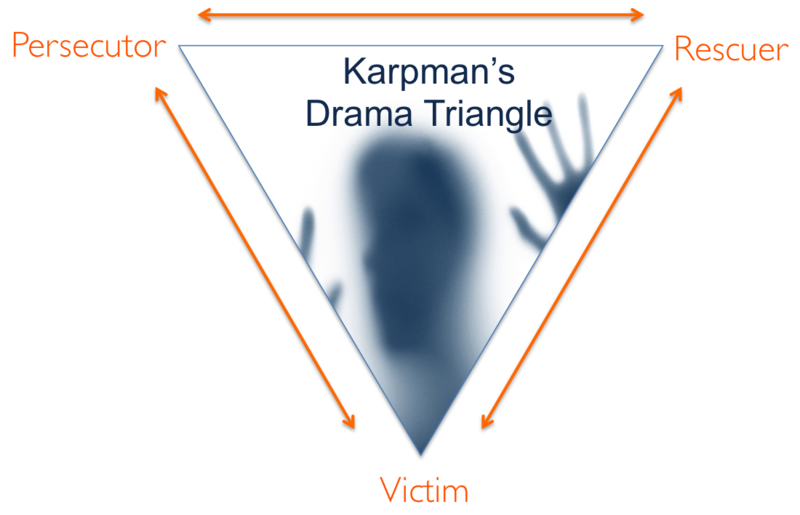 To understand the dynamics of the hidden messages we need to understand the three positions on the Karpman triangle. Imagine a situation where a parent, let’s say for the purpose of this example the father, has a daughter who, as a way of avoiding taking any responsibility for the mess she is making of her life, has been saying to a close family friend that she blames her parents for spoiling her, especially her father. Initially, she seems to be in what the triangle would term the Victim position. She has got herself into a mess and needs help. This attacking statement indicates how easy it is to switch from the Victim position into that of Persecutor. In this short example we can only suppose that the friend of the family had set out to be a Rescuer of some kind trying to comfort her, but inadvertently triggered a switch at some point, perhaps by defending her father. This criticism gets back to the parents. The father in particular is very hurt by this as he always felt that he had done everything possible to give their daughter a good start – the start of a plausible Victim position. He is so hurt in fact that it turns to anger and he would like nothing better than to tell their ‘spoiled brat’ exactly what he now thinks of her. This would place him in the position of Persecutor. He holds back because he knows from past experience that if he sounds off in this way to their daughter it will backfire: the response will be a tirade of abuse. In TA terms what might be going on here and what options might looking at the situation through this lens reveal? As we said right at the start, to begin with our states of mind are hopelessly muddled in such emotionally charged situations. In this case the daughter’s criticism, especially to someone so close to the family, has triggered his Child big-time. He loves his daughter and felt she really loved him. Now that seems a fantasy. The pain though doesn’t stop there. As well as hurt, his inner Child is furious, and so is the Parent in his head, who feels it is their job to protect the inner child from harm. They feel that they have a duty to let the daughter know exactly how wicked she has been. We can capture this tangle up to a point in another diagram. The Parent circle is very faint in the daughter’s profile on the left. That’s because I am assuming, for the purposes of this example, that the daughter has a poorly developed Parent function in her head that impairs her impulse control, hence the behaviour that needed excusing and her father’s fear of an explosive reaction from her. Also her Adult is heavily contaminated by her Child. The father, on the right, has an Adult heavily contaminated by the hurt and angry Child in his head, and his possibly even angrier Parent. The arrow from left to right is the triggering criticism from the daughter reaching the parent via the friend. It’s indirect but it was simpler to draw it this way. The arrow to the right of the father’s profile denotes the messages pumping up from the Child inside to the Parent. 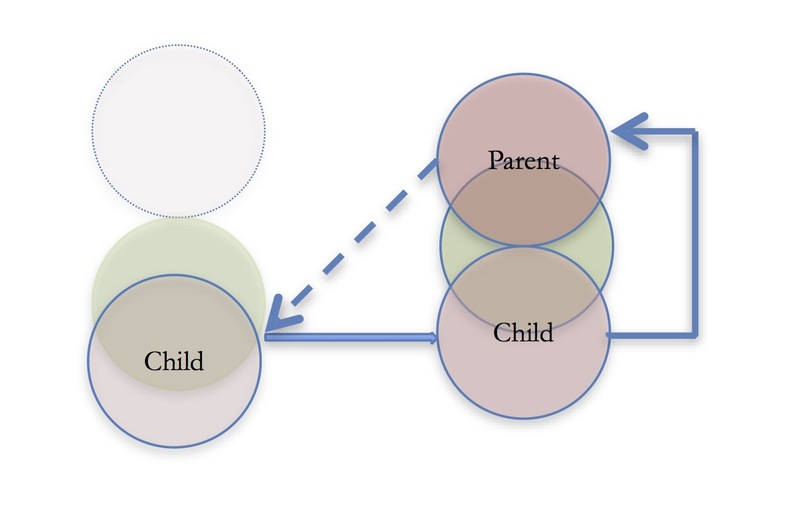 The broken diagonal line from right to left denotes the potential attack from the father’s Critical Parent upon the blended Adult/Child state of the daughter. How on earth can any of this help the father decide what he might do, what other options he has? Well, there are probably quite a few, but let’s pick a couple of possibilities. Let’s assume he allows himself time to cool down more or less completely. It might not take all the hurt away but the anger should diminish significantly. This should give the Adult a bit more space to think. It could possibly occur to him then that coming down heavily from his furious parent is the most likely way to provoke a tantrum back. That leaves two other ego states to choose from. You might think that it’s obvious to play the Adult card, and, for reasons we will look at, it could be the right thing to do. But there is another possibility worth considering. What is most likely to create a bond of sympathy with the daughter – an Adult, and an older adult at that, giving her a lecture even from a calm place in his head, or a Child in pain? It is just possible that if he showed her his pain, and simply explained that there was anger there because of the pain, but keeping the focus on the hurt, it might just help her understand him better, and help her realise for herself, rather than be told by him, that her self-serving accusation about him to a family friend was perhaps not the best thing she had ever done. Depending on the daughter’s exact mental makeup, of course, the Adult could be a better approach. Maybe the Child in her head is just too self-centred to care that she hurt him, but if he can connect with a more grownup part of her mind he can at least create a degree of cognitive empathy that might help mend their relationship. I know I haven’t dealt with the possible pay-offs in any detail, except for the possibility that the daughter blamed her upbringing for her lack of impulse control thus making it possible to feel OK by suggesting her father was not. In similarly simple terms we could see the father’s self-esteem having been dented by the family friend’s knowing this, as well as feeling somehow he might have failed as a father (I’m not OK). This would create a need to redress the balance by a good dose of righteous indignation, putting his daughter firmly back in her place: I’m OK/She’s not OK.
What it illustrates, hopefully, is that when this process of difficult disentangling has progressed sufficiently it becomes possible for the Adult to think clearly and make a better contribution to deciding what to do and how to do it. 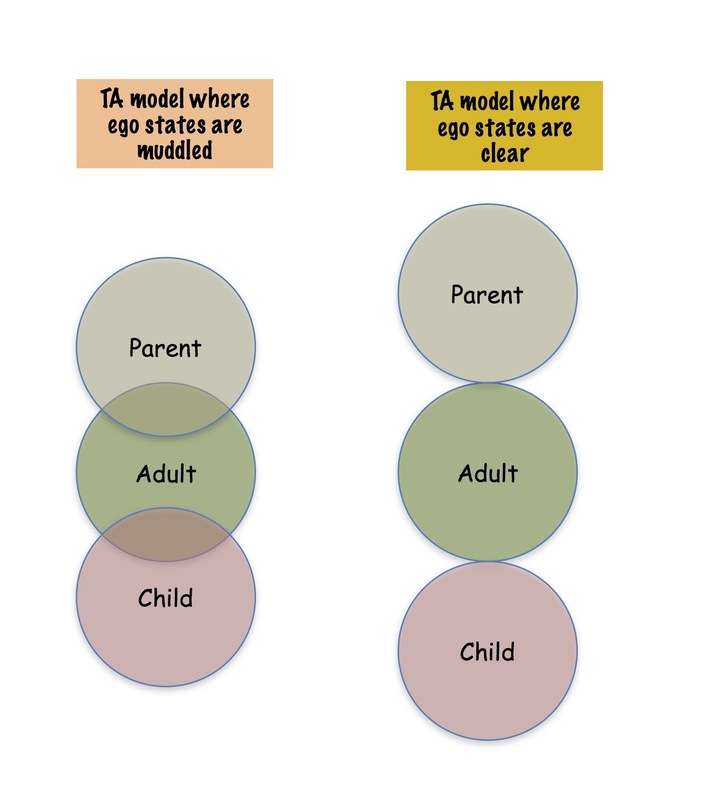 The situation then becomes more like the second part of the diagram where Parent, Adult and Child are clearly distinguished. As I discovered through further experience this model does not go far enough. More of that next time.